At Bright Green Enterprise, we use STEM-based activities in order to talk to students about entrepreneurship, sustainability, and ethical business. That’s why we love celebrating World Science Day for Peace and Development, and reflecting on some the year’s most impactful scientific developments. Celebrated every 10th November, this day brings our attention to the importance of science in our daily lives, and how it plays a role within all aspects of our societies. By highlighting the relevance of science, and encouraging wider public engagement on scientific issues accessible….more people are encouraged to be involved with the world of science. The theme for this year is “Science, a Human Right”, which celebrates the 70th anniversary of the Universal Declaration of Human Rights (art. 27), and the Recommendation on Science and Scientific Researchers. This theme highlights that everyone has the right to participate in, and benefit from science, and will hopefully open up the historically exclusive scientific world. By involving all members of society in scientific developments, surely it will only bring about greater progress, with stronger promises for the future. Science may seem irrelevant or inaccessible to many, with various scientific advances seemingly completely disconnected from our daily lives. But, not only does science touch our every day, from the shampoo you use in the morning, to the car you drive to work, it allows us to experience a world with ever-expanding possibilities. Whilst this may seem out-of-reach to a vast proportion of our societies, and truthfully so, the scientific world has not always been accessible to the wider population, this UN day of science celebration aims to broach the disparities and encourage wider general participation. World Science Day aims to create a stronger link between science and society, bringing new scientific developments to a wider public audience, and ensuring that society are aware of possible discoveries which may directly, or indirectly, affect them. Especially prominent in this year, by linking society and science, we can also see the incredible impact that scientists make, by working to protect our beautiful planet, and helping us to create more sustainable societies. So let’s have a look at this year in Science – a few top discoveries and analyses which help us to understand and protect our planet, and our people. The “Ledumahadi mafube” was identified by South African researchers from its restored fossil- one of the largest land animals, this dinosaur weighed in at a whopping 26,000 pounds! That’s twice the size of an African elephant! Also in South Africa – archaeologists discovered what they believe to be the earliest known drawing created by Homo sapiens. At roughly 73,000 years old, this drawing out-dates drawings previously thought to be the oldest, by 30,000 years! This drawing could help us to learn more about how humans used symbols, which led to the development of language, and civilisation itself. Researchers have learned that the sharing and spreading of information on social media following natural or human disasters could have potentially disastrous impacts on public safety. Whilst information sharing can be extremely useful, it is important to be aware of the dangers of rumours, and falsifying of information, and how this can impact on human behavioural responses. Understanding trends like these can help decisions in evacuation planning, and the actions of emergency services when responding to future disasters. Scientists at the Gladstone Institute in San Francisco managed to erase damage caused by Alzheimer’s disease in a human brain cell. Whilst further research is needed, and the implications of these discoveries is still unknown, this could be the first step towards creating a treatment for a disease which affects millions worldwide. 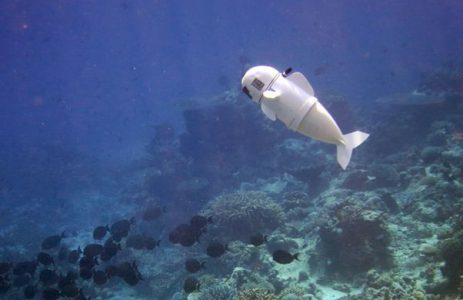 The Soft Robotic Fish (of SoFi) is an oceanic robotic creation, designed to study and monitor underwater populations. With its fins and tail, SoFi can move inconspicuously among underwater life, allowing scientists to identify ways in which to better protect and conserve our oceans. With advances and discoveries such as these, I understand it can feel quite apart from anything that may directly impact on our life, or indeed, that we ourselves could possibly dream up. But, from working in schools across the country, I can assure you (and myself) that actually, discoveries like these are not so out-of-reach, especially for those young minds yet unhindered by the doubts and restrictions of societal constructs. We’ve seen apps to help prevent food waste, street lamps powered by the very cars that drive down the streets, solar-powered water pumps for countries which experience minimal rainfall. A never-ending list of inventions addressing global issues. Whilst the science may not always be correct, the enthusiasm, innovation, and determination never fail to impress me. For me, when working with students through our programmes, especially Green Dragons, it excites and inspires me to witness the next generation of thinkers, creators and makers, as they explore, conceive and construct. Those who will step into the world with eager minds, and open eyes, are bound to lead the onward journey towards discovery, and I hope that it is an ever-increasing breadth of people who also learn to reap the benefits of that very exploration.